It's easy to tell when a wave of sadness washes over my mother-- In mid sentence she'll change the subject of whatever we're talking about in a very matter of fact manner. Lately she's been changing subjects, during our frequent phone conversations, a lot because we're coming up on the first anniversary of my step-father's unexpected passing. That last part took me a really long time to type. "Anniversary" seems like a very wrong word to use. Referring to my sweet step-dad, Dave, as "step" seems very wrong, as if he was not fully a part of our family. And mentioning "passing" and Dave in the same sentence still seems very wrong too. I can only imagine how it must feel for my mom-- thus the frequent sadness and subject changes when something overwhelms her and she remembers Dave is not physically there with her anymore. In late July, 2011, my folks were in the process of packing up their home and moving into a beautiful new house in a senior living community that would provide them with not only independence but also all the medical care and assistance they might ever need down the road. Their upcoming move was truly a blessing in that it was their idea. Both realized their large, two-story house with no downstairs bathroom was becoming a problem for them. Each had a few medical problems like arthritic knees that were being dealt with and when they understood they could actually afford to move to a beautiful one-story house in a community with a continuum of care, AND they could bring their dog too, they gladly signed on and started packing. My mother is a journal writer and for years has written at length each night before turning in for bed. They've never been fancy journals-- thick spiral notebooks were practical and priced right for her needs, her small printing filling at least one full page per day. I know from our conversations over the past year that mom has been reading last year's journal and comparing each day to the previous year and reminding herself of the life changes she's been dealing with. The last time I saw Dave, he and mom were in their front yard holding hands together and waving good-bye as I backed out of their driveway for the airport to return to my home in Los Angeles. It was a hot Ohio afternoon but we felt good about the progress we had made during a massive four day garage sale we'd just completed in preparation for their move to the senior community in six short weeks. My flight that should have landed at 10:30PM was delayed and didn't land until 1:15AM. I was blurry-eyed by the time I wheeled my suitcase up the driveway to my front door. Twenty minutes later, as I was preparing for bed, my phone "pinged" indicating I'd received a text message. Because of the late hour, I knew something was very wrong. "Dave's in ambulance on way to hospital." Middle Sister sent it and I was stunned. I'd just seen him ten hours earlier and he was fine. But obviously he wasn't and no one knew (including his many doctors). And now everything is different and my Mom is sad. Today I asked mom if reading her old journals helped with the healing and mourning process. 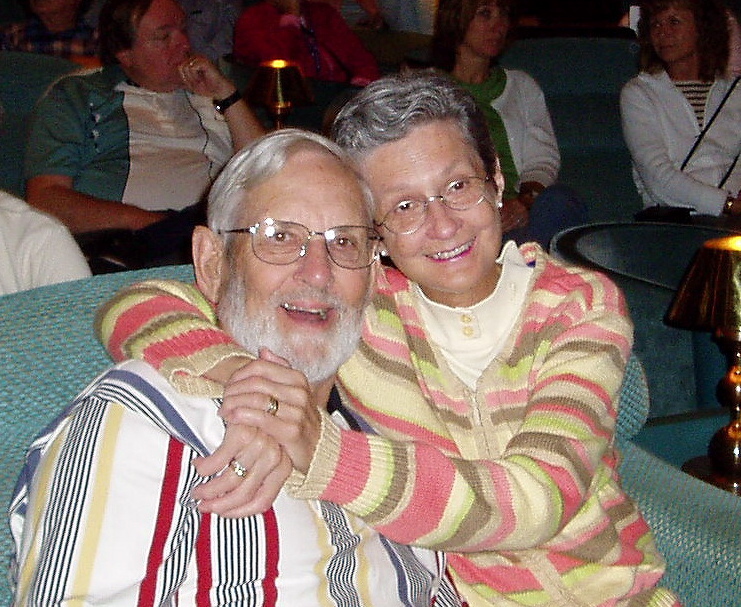 Being a deeply religious woman, mom said she thanked God everyday for her husband of 20 years and that reading the journals helped remind her of their shared spirituality and of the many "little things" they did together. When I asked why when she felt sad she needed to change subjects so purposefully, she of course-- changed the subject, I suspect because she decided she'd met her "crying quota" and didn't want to make me sad too. I kept steering the conversation back to make the point that we are all sad, and all cry, and all miss Dave terribly. 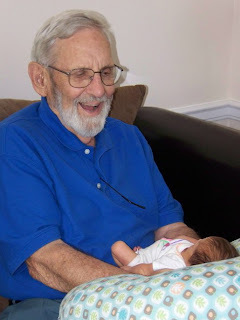 I'm not sure what Mom will write in her journal tonight but I know she will be awake in the wee hours of the morning knowing that this time last year, Dave passed away peacefully in his sleep less than 48 hours after the ambulance had been called. I hope she writes that her family supports her 1000% percent and are extremely proud of the grace with which she's handled herself since our sweet Dave died. Each morning of their life together, Mom sipped tea and Dave gulped coffee down as they said their morning prayers together. They spent about an hour each day in the quiet of their living room, sometimes glancing out their bay window and taking a moment to comment about the activities on their quiet street. Now my mother sits at her new kitchen table alone looking out the front door window, their dog, Noah, by her side. Tomorrow after her prayers Mom will take a large basket from the shelf in her bedroom containing more than 200 sympathy cards and letters that were sent to her when Dave passed away. She'll make herself a second cup of tea and read each message drinking in the kindness and memories from loved ones. As sad as she will be, and as deeply as she misses Dave, she will remember how many people all said the same thing about her beloved husband-- He was such a good man. The thing that stands out for me in your post today (and the one you wrote a little over a year ago) is how much love there is. Dave for your mom. Your mom for Dave. Your family for both of them. And he'll never be completely gone because all the love is still there. And that's a lovely thing. I remember this day from a year ago. You've written a great tribute of Dave, but also of love and of your Mom. I love the way you speak of your family. Although you are far apart, your hearts remain close. What a beautifully written tribute to Dave and your Mom's love for him as well as your own sense of loss. How lucky you were to have had him in your life! I, too, remember that post. So sorry for your loss. Hugs to both you and your Mom. Oh Joanna, such a touching post, my heart is with you and your mom today. Your mom is very lucky to have had Dave in her life and to have you to share the grief with her now. I hope your good memories and shared love can help ease the pain of the anniversary. It's so hard when you lose a loved one, I"m very sorry for everyone concerned Joanna. Anniversaries are especially hard for those of us who have lost loved ones. That is almost all of us, but when we lose a life partner or a child, that is the hardest to bear. I'm thinking of her today, and I so appreciate the beautiful post you wrote telling about it. Oh JJ....I hope with time your Mom's heart will heal and there will just be tears of laughter and joy. ((hugs)) to you all ! To have twenty years with a good man sounds like a dream to me. I am so glad for your mom that she and Dave had that long together, and I am also hoping my end on this earth comes as peacefully as Dave's. I know your mom misses so much about being with Dave, and she is still grieving. One of my good friends here has been a widow 24 years and she still misses her husband. I am learning about long term relationships here. As you know, it better that your mom does allow herself to grieve, for however long it takes and in what manner she chooses. My heart goes out to your mom and your entire family for the great loss in your family. I remember so well the tribute from last year. The pain doesn't disappear, nor do the memories. Dave will always be a huge part of all of your lives. I'm praying so deeply for your mom right now. I know that she must be hugging on to her memories so tightly right now. Dang it! Life can be so beautiful and so painful at the same time. I can feel your love and loss oozing out of this post. I remember your original post about your stepfather from last year. My heart goes out to your mother and your entire family. Dear JJ, I wish your Mom and you peace. oh, her loneliness must be terrible. what a sweet-looking couple they are: well-matched, buddies, kindred spirits. This past year has flown by, hasn't it? I'm sorry you all lost this lovely man, but like you mom says, there are a lot of blessings from having him in your lives for a mere (too short) years. This is a beautiful post, JJ. My thoughts are with you and your family. Thank you for sharing Dave with us. Nice tribute . . . we can all feel your pain, and your love. Wonderful post. Love to all of you. I think it's amazing how much love your family has for your step father. So often that isn't the case. Dave sounds like he was a wonderful man, Dad and Husband. I'm sorry for the sadness your Mother still feels, yet it is all part of the greiving process and to lose someone you love so much, I wonder does one ever lose that sadness of missing them. Big Hugs my Friend!! Wonderful post for a wonderful man. Keeping close to your mom I suspect is good for both of you. Beautiful! My heart goes out to you all. I remember your post from last year..what a lovely blog post and I am praying your Mother and you are having better days, the memories of your Dave are wonderful love is so important in one's life, we had two kitteh cross the rainbow bridge one week from another and I am still traumatized, I could not work, people made insensitive comments about they are just cats to me, i cried inside trying to be brave on the outside..grief is grief is grief..Praying your Mom and you will have some happy days coming up, life is so precious, my prayers and wishes for good days are sent your way..cioa from the beautiful pacific northwest we escaped the drought this year, we only get about 29 or 30 non cloudy and blue skies a year!!!!!!!!!!!!! :( :( :( This is a wonderful tribute to both your mom and Dave. I suspect you're already doing this in abundance, but the best advice I can give is for you to hug Your Mom - often, tight, and throw in a few kisses. One of the main things missed when a life partner is no longer there is the amount of human touch that was a regular part of daily life. Fill that void whenever possible and you'll both be happier. Such a loving post. I know it must be hard for you being far away from her, but I'm sure she feels your love. Saying prayers for all of you! I can feel the pain so evident in your own words, Joanna and I remember very well when you wrote about Dave's passing last year. I hope the ache will lighten some, and that your mother and the rest of your family will take comfort in the many fine memories. Hugs to all of you. I can imagine the deep sadness you all must feel, and I send my best wishes for you all. And when I think about it, I realize, she is a lucky woman to have lived with and loved a dear man as her husband for as long as she did. That's pretty special. how beautiful! what a beautiful, loving and tender story. thank you for sharing such love with us. A beautifully written tribute. Your mom is so blessed to have such a loving, caring, daughter. Just beautiful and so sad at the same time. I cannot believe its been almost a year. Time goes so quickly. It will be hard for everybody but you have a wonderful family and you will get through it together. All the best to you all. I am so sorry for your mom's loss and sadness. I am, however, grateful for the reminder of how important it is to send love and sympathy in the mail.